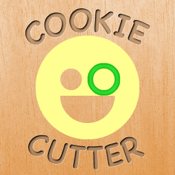 A great geometry puzzle game in which the goal is to make cookies matching puzzle shapes using only the cookie cutters provided in as few steps as possible. First of its kind game that develops geometrical shapes manipulation and spatial reasoning skills using a natural intuitive play experience. Intuitively develop feel for shapes symmetry, composition, translation, rotation and other geometrical operations. Use Cookie Cutter Challenge to develop and enhance skills with shapes.